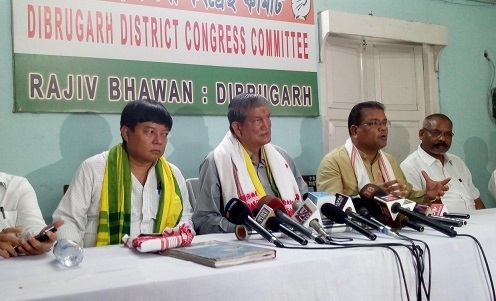 The Congress general secretary in-charge for Assam, Harish Rawat, on Wednesday lashed out at Narendra Modi Government for failing to fulfil the poll promises made by him. Rawat wrapped up his tour of Upper Assam on Wednesday. Rawat was sent by Congress president Rahul Gandhi to Assam to know the pulse of the people before the Lok Sabha elections to be held in 2019. The former Chief Minister of Uttarakhand, Harish Rawat, interacted with the workers of Tinsukia and Dibrugarh tea estates in his two-day tour of Upper Assam. Upper Assam is surrounded by tea gardens and earlier known as the bastion of Congress. In 2014, the BJP defeated the Congress in their bastion. The Congress top brass is very serious and don’t want to lose Upper Assam like 2014. “We hope that in upcoming Lok Sabha elections, we will do good job and take revenge of our defeat in 2014. We have not decided any candidate for the upcoming election because it will be decided by our party top brass,” Rawat said. “Petrol and diesel prices are rising day by day but the Government has failed to control the prices. When we are in the Government, the BJP criticised us for rising price of petrol and diesel but now what they are doing to control the prices,” Rawat added. Rawat said Prime Minister Narendra Modi proved himself as a ‘biggest liar’ in Indian democracy. Rawat came down heavily on Assam Chief Minister Sarbananda Sonowal for doing nothing for the common masses of Assam. “We gave special category status to Assam but after the BJP came into power they withdrew the special category status from Assam which resulted in huge financial crisis for Assam,” added Rawat. He also criticised the BJP for the pathetic conditions of the National Highways of Assam. On Wednesday evening at Ganeshbari tea estate during a Congress meeting, some Congress workers shouted slogan against former Union Minister Paban Singh Ghatowar. The protestors clearly stated that they didn’t want Ghatowar. Talking to the media, the agitated Congress workers said they want a new face this time. They don’t want Paban Singh Ghatowar. Harish Rawat said the agitating party workers were misguided by some party leaders because they didn’t come here for selection of candidate. “I don’t know why they have shouted slogan against Paban Singh Ghatowar. May be they are dissatisfied at him,” Rawat said.